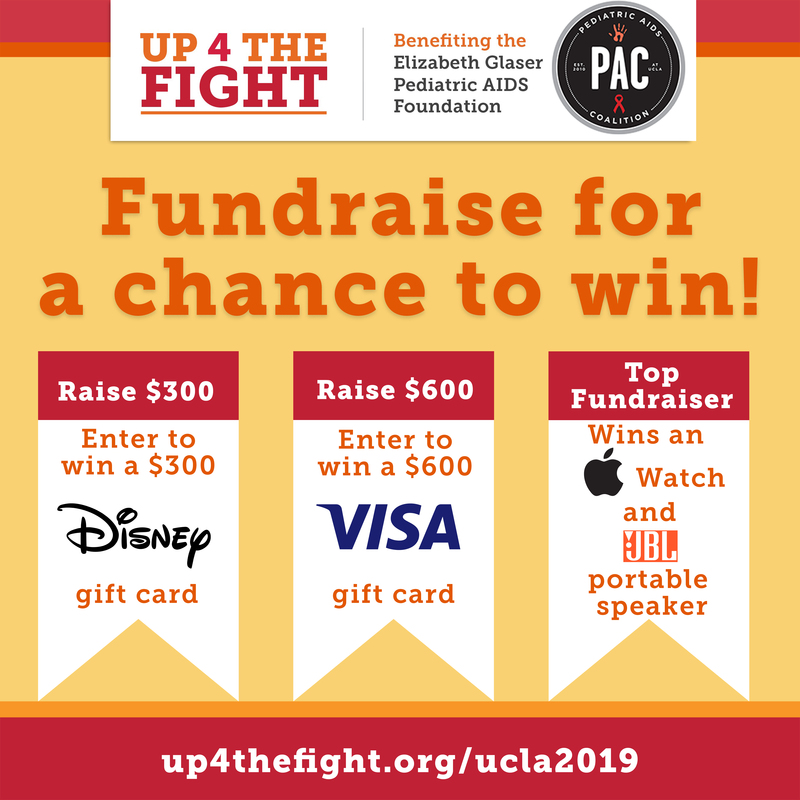 Join the Elizabeth Glaser Pediatric AIDS Foundation during this UP4THEFIGHT Dance Marathon season for a chance to win one of the amazing fundraising prizes! All eligible Dance Marathon participants at College of the Holy Cross, Baldwin-Wallace University, UC Berkeley, and UCLA for the 2017-2018 UP 4 THE FIGHT season have the chance to win one of the above prizes at their respective campuses. To be eligible, individual participants must reach the appropriate prize level by the final hour of their event day. Participants that surpass a prize level will graduate to the higher prize and will not eligible to win the lower level prizes. For example, if Sally fundraises $1,000, she is eligible to win the $750 prize level, but not the $250 prize level. All winners below the top fundraiser prize will be determined by an online random name selector and will receive notice within one week of their Dance Marathon event date. The individual event top fundraiser will be announced at the end of the Dance Marathon event. All donations collected online and in-person at the event will count towards the fundraiser's total. The competition will close at the end of the event and a winner will be selected, regardless of the fundraising total at the time of the announcement of the winner. Winners of the individual event top fundraiser challenge at the end of each event are eligible to win the Top Fundraiser Trip to Africa prize when that challenge closes; however, any fundraiser may overtake them during that time. For specifics and information on the top fundraiser trip to Africa, please visit www.up4thefight.org/topfundraiser. For more information and clarification, please contact EGPAF at up4thefight@pedaids.org.